Nuke London and start over. Get them out first and then purification by fire! I agree 100 percent Ana. I've always thought of myself as being English before being British. However, there is widespread racism among the English working class -- my cousin still refers to "darkies", which I think is an offensive term, even though she now lives in a small market town where a black face is so rare that it stands out. As for Will Self-Regarding, I always reach for the off button nowadays whenever his voice emanates from the radio. What a pretentious ratbag. Incidentally, your argument could just as well be used to point out the hypocrisy of many in the "gay community". Just as any criticism of immigration policy is dismissed as racism, so any criticism of gay activism, for example over issues such as gay marriage and adoption rights, is automatically dismissed as homophobia. Dennis, don't I know it! The EU Commission funds the Labour think-tank the IPPR, which advocates for the balkanisation of England. The political elites have set out to change the demographics of England so they can create divisions among people and split up England. English people need to aggressively reassert themselves in their own land instead of being passive observers to their own demise. Politically England has ceased to exist. Devolution has given a (loud) voice to Scotland and Wales whilst at the same time the British gov. of whatever hue has denied our existence. Listen to politicians in Westminster pontificating about "the NHS ,education, care for the elderly, prescription charges, student fees"
They NEVER prefix with, England's NHS etc. They talk of OUR NHS, they utter 'helping OUR elderly' etc. They talk of of helping people in "OUR country or THIS country. They don't want the Plebs to realise, the issues i've highlighted are no longer within the control of the (dis)UK Gov. where Scotland, Wales and N,I are concerned. They have been devolved away. Yet England gets MP's from all over the (dis)UK voting on English issues, without ever acknowledging England. Labour in the rotund shape of Prescott, tried to begin regionalisation of England. Something that has been a Gov. target since 1998. The Geordie's told him NO. But the policy hasn't been forgotten. Only yesterday some dinosaur by the name of Heseltine ressurected it. What they have never admitted was their desire to destroy any notion of Englishness. Governments of the Lib/Lab/Con all want the same thing a country called the UK. Scotland, Wales, N.Ireland and Britain. Sadly, their close to getting it. Daggs, I wish more people would open up to these simple truths. This country has been betrayed. I suspect it is already too late. Good piece though. Thanks, King Lear. It may indeed be too late. Will Self. The man has the power to annoy you from 100 hundred feet away. He has the power to annoy me from 100 miles or more! Britain, -hell, England!- holds its place as an empire-owner, because ~not in spite!~ of the multitude of nations (by an "empire", the current "Commonwealth of Nations" of course)..
--> downright unlucky (as the 20th c Austria-Hungary).. However, don't take me wrong: I'm not a eurofan! The UK has the right to disagree -or even secede!- from the European Union. By all means it's not "against the Law". However, it would be just wonderful for the country-members of Europe to further unite in blissful harmony, forming a more tightly-knit federation. Unite for whom, is the question that arises next: the nations and peoples of the continent, or just the banks, firms & oligarchs of european pedigree? Alas..! Seymour, I certainly am. I've printed it off but have not had a chance yet to digest it properly. I'll let you know what I think when I have. Thank you, Ana, I'll look forward to that. I don't speculate in that essay on the "future" for Britain, but since other people here are talking about it I'll give my thoughts. I think basically there is either going to be mass deportation, or social/cultural oblivion for the English. The reality will, of course, be more muddy and complex than that, but no less extreme. I don't believe this is going to end well. It really depends on whether the bulk of the Western countries wake up IN UNISON to the danger they're in - if only a few countries do, all the others will bully them into doing nothing to defend themselves. Seymour, it's a thoughtful and well-argued article. So far as deportation is concerned I would eject Paramdeep Singh Sehdev, whoever he is, immediately. In general terms my own position is quite clear - I am not opposed to immigration, a fact of modern life. 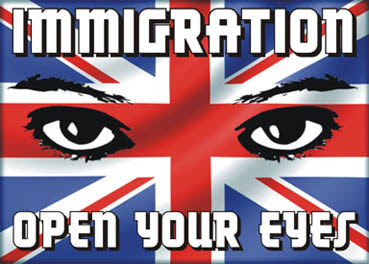 I am opposed to mass immigration, a consequence of political incompetence. Above all I am opposed to the lie of multi-culturalism, which is indeed a form of national suicide. Things simply cannot go on as they have been without serious consequences. It comes down to one old adage - when in Rome do as the Romans do. Immigration does have it's economic upside but it's cultural downside. Past experience of immigration on the scale that the UK has experienced over the past decade or so suggests that the outcome will in the medium term and that can be a very long time be one that is very dislocating especially for the indigenous population. In the long term it should on past performance in the end be on balance more beneficial and will enrich the culture. The long term is some generations away and so in the meantime we British(I am Welsh but have the same concerns) are going to be faced with some very serious consequences that may make Enoch Powell's predictions already proven right to be even more correct. The barbarians crossing our borders this time do have their Vandals and Visigoths but also some less fearful ones some of which there is the possibility of joining in common cause. Whatever the outcome the damage has already been done, the left have seen to that, so we must salvage what we can, little hope of that, and make the best of it. Antisthenes, in the long term, as Keynes said, we are all dead! I should make it clear that I'm not opposed to controlled immigration, but controlled immigration is precisely what we have not have. Either by accident or design, I'm not sure which, the administrations headed by Tony Blair and Gordon Brown allowed the barbarians, of whatever disposition, to flood across our borders. The damage may very well entail complete fragmentation. England committed cultural suicide on the Third of September, nineteen-hundred and thirty-nine. I certainly think the Second World War marked the suicide of Europe. Yes, the roots run deep. The enemy is within the gates, and it will be hard and painful to evict him. Start by identifying and exposing the traitors in all their repellent detail. Then, set about defining what characteristics are essential to a loyal, homogeneous patria and create an oath of loyalty and a standard of behaviour that fulfills that vision. Let no one remain who cannot swear to meet the conditions: exile the rest. Any such process must now be extremely unpleasant and harsh; Britain's enemies have deliberately made it so. But the war is already begun, and you will have to decide whether a bitter fight or capitulation will bring you the future you desire. Yes, Calvin, I wholly agree. The first thing, though, is to reclaim our national sovereignty, which means repealing the Human Rights Act and leaving the European Union. quoting: "England committed cultural suicide on the 3d of September, 1939" ..duh!?!? Oh, for the love of God and the glory of the vigilant nations from Lisbon to Vladivostok, what are you suggesting man? That England should had allowed Adolf & Hess to have their way with the Eurasia..? Even if the Brits joined forces with the Valhalans, and Blitzkrieg spared the British Isles for a while, the horrors of the righteous ones, would eventually crush the British Empire, as well..
Day after day, it becomes obvious that plans for a "IV' Reich of the Golden Millenium" are being carefully laid. .
Stelio, the Fourth Reich, I think, is already in place. Yes, what is manifesting itself now is the result of events that were set in motion decades ago. Russia also invaded Poland, did England and France declare war on Russia NO! The NKVD killed five thousand Polish officers and intellectuals at the Katyn forest and the west said nothing. Hitler freed Germany from Jewish bankers and the rich Jews in England wanted Germany back in their control, Hitler did not want war with England!!! The rich Jews in England convinced the Churchill and the war department that they would bring America into the war on the side of England ( Palistine was their price ). The American president's wife Elenor Roosevelt was a communist and the American people were duped into supporting communism, this is how you are being repaid today by being fed doses of socialism until your national identities are eroded. Communism was spread from Russia to Asia, Africa and the Americas as a result of siding with the Bolsheviks. As a result most of the "British Empire" was forfeit, the Third Reich and Fourth Reich are totally different formats, The brother wars were destructive, who but international bankers are behind this? The "Horrors" were an escalation of events by Churchill's targeting of civilians, other arrangements could have been reached with some English cooperation. Now Mass immigration with a rapidly multiplying imported population is overtaking western Europe, This is a tool to dilute individual national identities. Anthony, this country has entertained many past illusions but the illusion that we could go to war with Germany and Russia at the same time is not among them. The present is in direct relationship with the past, the future is being formulated by the present, do you see where we are headed? Ever deeper cycles of decline. I'm in a pessimistic mood this evening. I certainly do not understanwhat has become of Europe. Where are the people ? In my immigration years I realized that the only healthy way to immigrate is to get completely committed to the country of adoption ,its culture,lifestyle,ethos and politics. Without this kind of commitment anything else is deemed to be a failure on both sides . There is no other way. Any other way comes down to exploitation of the country its resources and the peoples hard work and ethos. If one immigrates to peruse the welfare or the healthcare (or any other resource) of the country without the regard of who pays for all of it shouldn't be welcomed. Period. UT, I have no argument at all with that. Britain has the worst immigaration policy imaginable. People should earn their right to a better living. There should be some criteria that people who who want to come in should have to fulfill. We filled whole towns up north with trash from some of the most backward parts of the globe, now we are letting in some of the most uncouth people from Europe. How can we afford all this when a significant proportion of our own indigenous population comprises of chavs. Britain is still good enough to attract the best minds from the outside world. Why do we have to go out and drag in everybody else's trash??? I think that's a question best put to our political leaders, ACI.